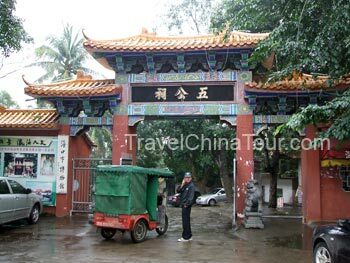 The Wugong Temple (Wugongci) is located about 8 to 10 minute taxi ride from Haikou city center. It was built during the Ming Dynasty and was renovated on various occassions during the Qing Dynasty. Of the limited few tourist attractions in Haikou city, this is probably one of the more interesting ones to see. Entrance of the Wugong Temple. Wugong is also known as the "five officials temple consisting of the Sugong temple, Hairui temple, Fubo temple, Guanjia Tang, and Xuepu Tang. The Wugong temple was built to commemorate the five famous officials Li Deyu, Li Gang, Zhao Ding, Li Guang, and Hu Quan. The entire complex is not large, covering about 2,800 square meters. The main building here is the Wugong Temple. 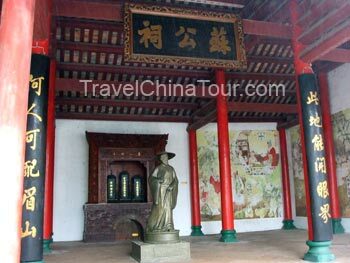 It houses life like statues of the five officials, and althought the building itself is only a small, two story wooden building, it is known as "The first building of Hainan". The Chinese characters "Hainan Di Yi Lou" is written in gold color on a large plaque placed on top of the entrance to the building. The Wugong Temple - 1st floor plaque says "Wugong Temple", and the upper 2nd floor plaque says "First building of Hainan." Sugong temple is dedicated to one of the greatest poets of the Song Dynasty named Su Dongpo. He lived in exile in Hainan for four years (1097 - 1100) where he lectured, trained, and taught talented individuals. He played an important role in spreading the development of cultural and educational causes of Hainan Island. Su Dongpo died in 1101,, and the people of Hainan engraved the portrait of him in the Wugong temple here. The Sugong Temple, dedicated to the poet Su Dongpo. The Sugong temple is located in the east side of the Wugong temples, and it contains some history of the Dongpo Academy. After Su Dongpo died in 1101, the people inscribed in the place where he had lived as "Dongpo's Reading Palace" to commemorate the poet. 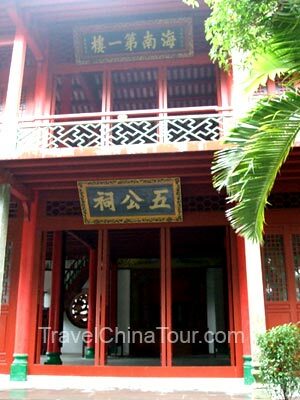 Later, a school was built for learning and it was named the "Dongpo Academy", which was one of the earliest academies in Hainan history. Throughout the reign of the following dynasties, many famous and talented students graduated from the acadmy. In 1899, the academy was closed down. Aside from Wugong Temple and other templs in this area, there is also a large museum with 9 display halls; however, most of the displays here had little to do with the Wugong Temple. Inside on display are historical events and historical figures from various periods during Chinese history. 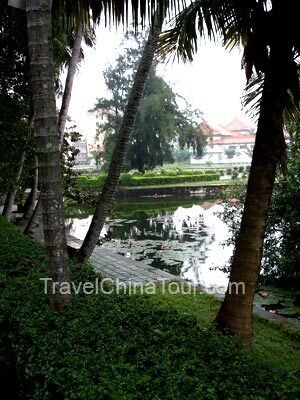 A nice photo of the pond in the center of the Wugong Temple.